I hoped to solve my issue making 2 dotCover snapshots and comparing them, but can't seem to restrict these snapshot to between these 2 breakpoints. The snapshot simple grow too large to investigate properly. Can anyone help me out? This scenario is currently not supported directly, however you can achieve the result using internal features. press Ctrl+Alt+Shift+F11 to get "Expert Options" button, click it to get options dialog. 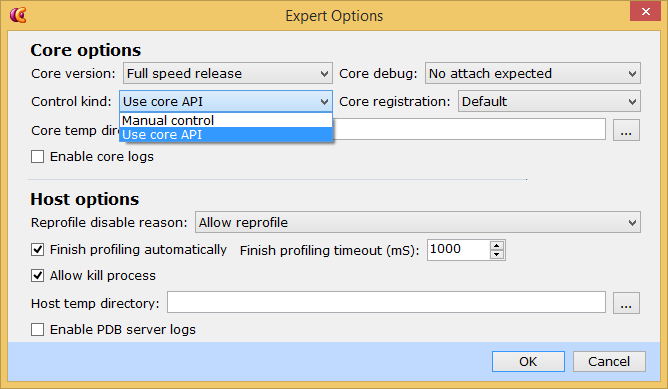 In the options dialog choose Control kind = "Use core api". In the end you should get a shapshot which contains info about all the code executed between the breakpoints. Please let us know if you'll need more details.